Towards the end of his life, saxophonist David S. Ware reunited with pianist Cooper-Moore for a set of brilliant recordings with a quartet called Planetary Unknown, (two recordings released on AUM Fidelity in 2011 and 2012). Yesterday, Martin reviewed AUM's re-release of Ware's first recording, Apogee (1977), that also featured Cooper-Moore. 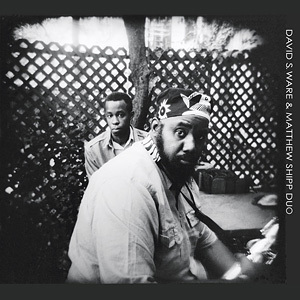 In the intervening years, Ware shared a 17-year long affiliation with another pianist, Matthew Shipp. Shipp and Ware connected in 1989, when Ware was seeking a pianist to work with in his group and mutual acquaintances suggested Shipp. Of their meeting, Shipp has said: "David got in touch with me and we started playing together. I was a big fan of Ware's work. Playing with Ware is like being at home. My style of piano really fits his compositions. He gives me freedom to be me. He doesn’t put any restrictions on me." This partnership's strength became clear on a multitude of albums from 1990's Great Bliss Volume 1 to 2007's Renunciation. Through trios and quartets, their musical relationship is well documented. However On Live in Sant'Anna Arresi, the pair is finally presented as a duo, and the result is an absolutely riveting performance. Drummerless, bassless, leaderless, Ware and Shipp engage in an extended improvisation, a conversation, that through ebbs and flows, and never loses its vitality. Their show is at turns bombastic as well as tender, and the push and pull of it propels the music effortlessly. 'Tao Flow (pt 1)' is a 20 minute segment of the improvisation. It starts with a keening cry from Ware over Shipps economical chords. Repeating the phrase, or perhaps rephrasing the repeat, Ware and Shipp begin to build their modern architecture upon a tried and true foundation. Sharp jabs, clean breaks, tight angles, and sonic load bearing beams of melody and rhythm criss-cross. The intensity that Ware reaches is stirring, and one can hardly be unmoved by the absolute honesty of his sound. The second track, 'Tao Flow (pt 2)' is a continuation of the concert, but through a clever edit, it catches the moments where Shipp's hands are inside the piano, and there is a spaciousness that soon has Ware filling with intense musical bursts. They slow down the pace a bit as Shipp slips into the lower register, playing repetitive and percussive passages connected by quicksilver runs. During the final five minutes of the concert, the duo 'trades fours,' a true exercise in parallel play as their solo passages connect by contrasts rather than any continuance of an idea. Ware was a powerful player and with his saxophone communicated spiritually and physically - even on a recording from a dozen years ago, it's palpable. Shipp was at the core of Ware's groups for a long tenure and the reason for this is obvious in this performance. A big thank you to AUM Fidelity for releasing this concert.